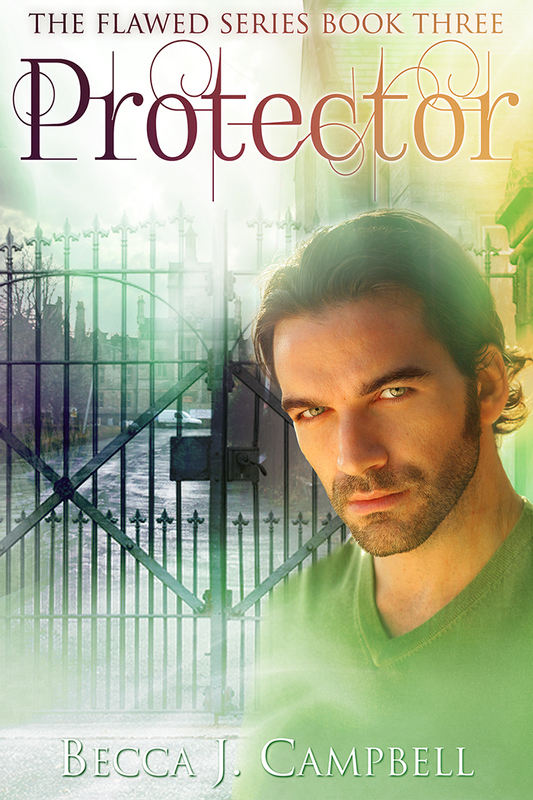 Protector (Flawed #3) is finally available! Pick up your copy today at Amazon, iTunes, Barnes & Noble, Kobo, and elsewhere. I’m currently running an early bird special: Protector (Flawed #3) is $2.99 from now until the end of the month. Monday the price will increase to $4.99, so grab it now to save a few bucks. Here’s a peek inside the book. “So, you found my note.” Violet gave him a coy smile and ignored his glare with a toss of her hair. Logan caught a whiff of lilac. He couldn’t forget the way she’d manipulated him last year, and the way she’d gotten under his skin when he needed a confidant years earlier. He knew he would never beat her by reporting her behavior. If there was one thing she was good at, it was reading people, playing on their reactions, milking every last drop of compassion. He didn’t have her charisma, let alone her ability at deception. He couldn’t win that game, and being a male professor had little to do with it. Violet’s eyes flicked to the framed picture on his desk. It was the photo he’d taken of Jade last year on their first planned hike together. A confident smile lit her face, and her hair billowed out behind her. It was before they’d started officially dating—ironically, it had led him to consider leaving Colorado Springs for good. But he’d eventually decided to stay. Logan held her gaze but didn’t answer. “When are you going to ditch that chick?” She gave an exaggerated groan of disgust and flicked her auburn hair over her shoulder. That lilac scent again—too floral, as if he were in a flowerbed—wafted over Logan, and his stomach clenched, matching the tightness everywhere else. Raw emotion hiccupped inside Logan. His throat constricted, and his mouth went dry. All the times he’d held back around Jade came to mind and taunted him as if they were Violet’s allies—and yet Violet knew nothing about the real reason. It was as if his words gave Violet life, somehow imparting a new level of vibrancy. She seemed to radiate with energy, every part of her coming alive with heat and vigor and passion. Logan roared as pure, animal fury ripped through him. He lashed forward, shoving her off, his muscles reacting like whiplash. Violet flew across the office like a rag doll, her body crashing into the far wall. She landed slumped against the floor. Terror snapped Logan back to his senses, every trace of anger vanishing. The hot fury turned icy cold, slicing down his spine as he rushed to where she’d fallen. “Violet! Are you okay?” His heart pounded like a jackhammer as he grabbed her shoulders and searched her eyes. She stared as if in shock, but a second later she blinked. Nodded, as if confused. He scooped her up in one quick motion, checking the floor beneath her. No blood. Not on the wall, either, but it had been damaged—a sharp vertical crater had torn the drywall open. Small chunks of debris tumbled out of the crack. “Yes. I think so.” The tone of her voice had morphed completely, taken on the timbre of a young girl’s. Violet regained her composure. Her back straightened, and Logan breathed a silent sigh that nothing seemed to be broken. She stood and winced, a hand reaching to touch her hip delicately. He bit his lip. No doubt she would have bruises. “I’m sorry,” he said, feeling even more helpless in this situation than when she’d goaded him. When she made to stand, he reached a hand to help her out of the chair. She ignored it and rose slowly, as if testing her balance. Her eyes had lost all of their energy, and her skin was pale. A strange aura of vulnerability replaced the proud set of her shoulders. “I’m fine,” she said. Her expression was hesitant but showed no trace of the anger Logan expected. Apparently his attack had disarmed her. He cringed. Attack. The word tore through him, shredding his insides. “I’ll talk to you later.” She stepped toward the door. Logan watched her go, felt his mouth hanging slack. But there were no more words—there was nothing he could say to possibly make this better. After she left, he eased the door closed and turned to stare at the damage. He touched the break in the wall’s surface, and his fingers came away dusty with white powder. How could he have let this happen? How could he have lost control so utterly? Her taunts weren’t an excuse for his behavior. Logan’s shoulders sagged. His power was too much to handle. What if something like this happened in a fight with Jade? Get Protector (Flawed #3) now! This entry was posted in Books, Writing and tagged Amazon, amreading, Book three, books, ebook, empath, excerpt, Flawed series, Jade Edwards, Kindle, Logan Henry, NA, New Adult, paranormal, Protector, reading, sale, superheroes, supernatural abilities, suspense, thriller, urban fantasy, YA, young adult. Bookmark the permalink.